Price Notes Prices Per Hour , If you like to have 4 hours please contact us. 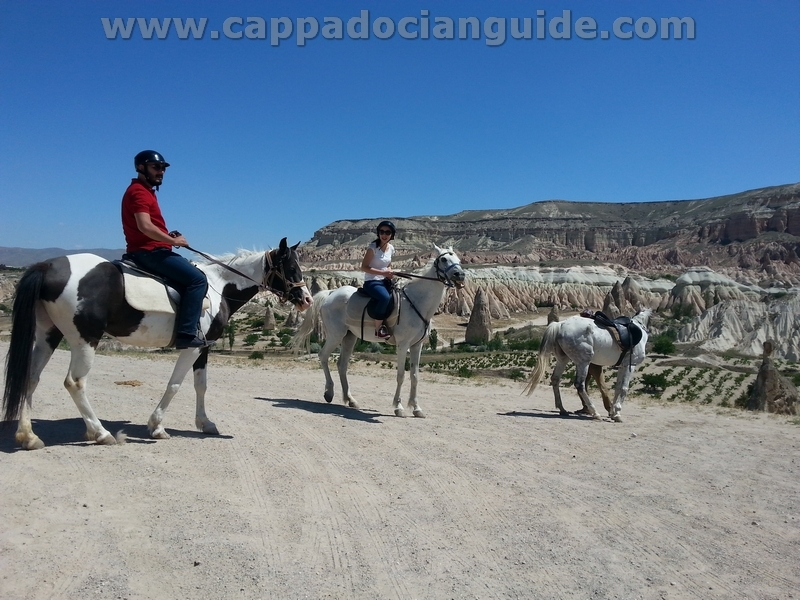 Cappadocia, “The Land Of Beautiful Horses” can best be seen on the back of its legaendary mounts, horseback riding through wild valleys and ancient settlements. Horseback Safari is a group of activity that enables you to enjoy the harmony of the horse and the rider with nature. Every groups has experienced guide who knows the region thoroughly and can speak English fluently, and tours generally last 2-3 hours, but can last the whole day. We also organise longer tours, with tent or hotel accommodation. 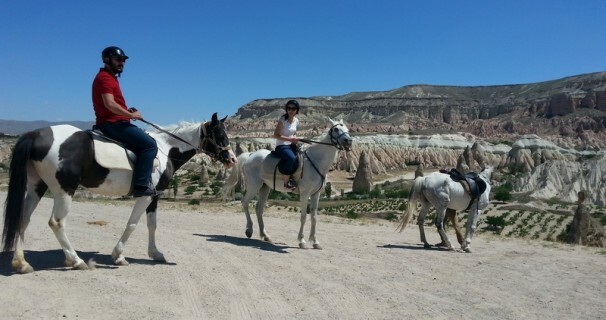 The Ranch is operated by a professional team who have been organising horseriding tours in Cappadocia for over five years and all horses are well-looked after, friendly and safe. – For your comfort and safety, please wear long trousers and walking shoes. You can enjoy your 1 h Horse Riding at anytime of the day between 10:00am to 20:00pm. We will collect you from your hotel at least 30 minutes before ride departure so you have time to get acquainted with your horse and riding equipment. The ride will take you trough beautiful landscape around the Canyon of Rose Valley and Love Valley. 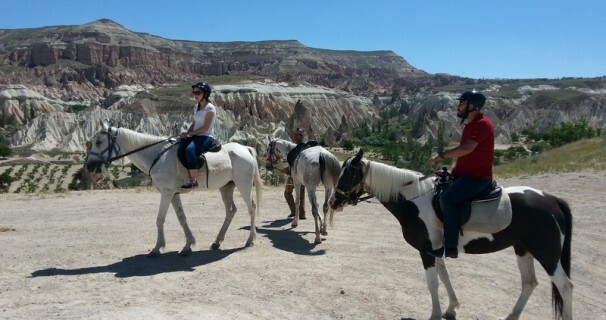 The ride offers magnificent views over the Goreme National Park. You can enjoy your 2 h Horse Riding at anytime of the day between 10:00am to 20:00pm but We recommend you enjoy during sunset time.We will collect you from your hotel at least 3 hours before sunset and drive to our Ranch. Transfer to ranch takes almost 10-15 minutes then you will have time to take your first pictures, choose your horse, get acquainted with your horse and riding equipment. 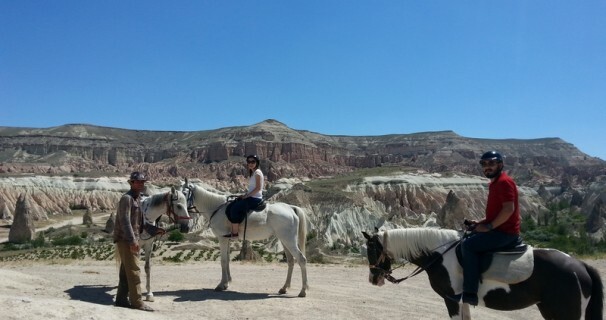 The Safari will take you to the most famous 3 destinations of “Fairy Tale Landscape” of Cappadocia. Firstly most interesting rock formations of the region at Love Valley, Secondly Cavusin Old Town then you will visit one of the secret cave churches of Cappadocia (Column Church or Cross Church) at Red Valley and Finaly top of Rose Valley wich is “The Best Sunset Viewing Point of the Word“. The 4 hours Safari will take you to almost all the places you should visit in Northern Cappadocia. 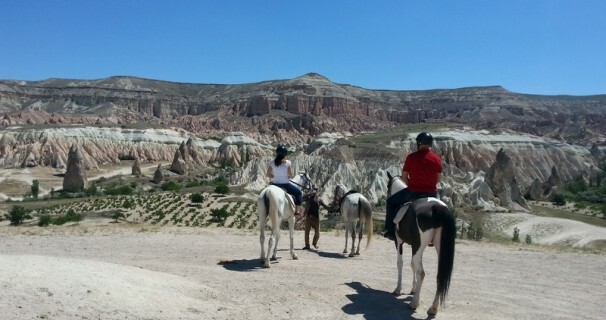 Adventure start with the best view of “Goreme Town” then spectacular rocks at “Love Valley” and “Swords Valley“. We will visit “Column Church” which is one of the splendid cave churches at “Red Valley” then have break for exploring Cross Church and tasting local wine or fresh fruit juices at top of the “Rose Valley“. We will continue with Cavusin Old Town and finaly we arrive in “Pasabagi” where you will explore most famous rock formations of Cappadocia which known as “FAIRY CHIMNEYS“. -We guarantee to book 2 people and more. You need to book in advance. Breaks are added to the total hours. We can also combine this itinerary with sunset ceramony.